Escarlatina Obsessiva is a rock duo from Brazil, made up of Karolina (who plays the bass and provides the vocals) and Zaf (who plays the guitar, keyboards, and synthesizers). The duo was formed in 2006, and is influenced by European post punk and American punk rock bands from the 1980s. Escarlatina Obsessiva has already released two albums, “Chants of Lethe” and “Blossomy Parks.” Their latest album release is entitled “Pandemic,” and it has just been released on the French netlabel Zorch Factory. The album features ten brand-new punk and post-punk tracks. 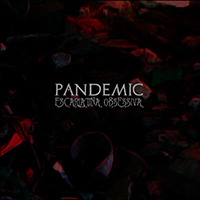 Each of the tracks on “Pandemic” has a strong, driving beat that makes headbanging almost impossible to avoid. This is definitely music you can mosh to. The percussions play a leading role in all of their songs. Meanwhile, the keyboards and synthesizers add a good contrast to the strong percussive beats, adding something a little smoother to the mix. Unfortunately, the weakest element of all the songs are the vocals, but not because they’re bad singers. The vocals on this album all sound a bit distant, so you can barely hear and understand what they’re singing. It sounds like there was a problem with the sound mixing on the songs. Still, that definitely shouldn’t affect your enjoyment of their album, and you should still take time to try and take in the vocals and lyrics. My personal favorite tracks on this album are “Buried in Sand” (the opening track, which eases you in to their sound), “Cotard Flees” (you can also check out their video to that song below), “You’re Invisible,” and “Eyes Like Stars” (which slows things down a bit, but still rocks). If you are looking for 1980s-inspired rock music to bang your head and shake your body to, then Escarlatina Obsessiva’s “Pandemic” is an great choice.